Definition at line 149 of file programinfo.cpp. Referenced by GetNextRecordingList(), LoadFromOldRecorded(), LoadFromProgram(), LoadFromRecorded(), and LoadProgramFromProgram(). Definition at line 235 of file programinfo.cpp. Definition at line 319 of file programinfo.cpp. Definition at line 348 of file programinfo.cpp. Definition at line 359 of file programinfo.cpp. Definition at line 511 of file programinfo.cpp. Definition at line 625 of file programinfo.cpp. Definition at line 803 of file programinfo.cpp. Definition at line 913 of file programinfo.cpp. Definition at line 949 of file programinfo.cpp. Definition at line 989 of file programinfo.cpp. Definition at line 1033 of file programinfo.cpp. Definition at line 267 of file programinfo.h. Destructor deletes "record" if it exists. Definition at line 1263 of file programinfo.cpp. Definition at line 1049 of file programinfo.cpp. Definition at line 1056 of file programinfo.cpp. Referenced by RecordingInfo::clone(), PlaybackSock::FillProgramInfo(), RecordingInfo::operator=(), operator=(), and Reload(). Definition at line 1175 of file programinfo.cpp. 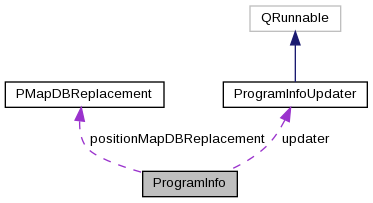 Referenced by RecordingInfo::clear(), PBHEventHandler::event(), LoadProgramFromRecorded(), RecordingInfo::operator=(), ProgramInfo(), and SavePositionMap(). Definition at line 1372 of file programinfo.cpp. Definition at line 1560 of file programinfo.cpp. Referenced by ProgLister::ClearCurrentProgramInfo(), ViewScheduled::FillList(), PlayerContext::GetPlayingInfoMap(), ProgLister::HandleSelected(), ProgLister::HandleVisible(), PlaybackBox::ItemLoaded(), ScheduleEditor::Load(), TV::QuickRecord(), TVBrowseHelper::run(), SchedEditChild::SetTextFromMaps(), ProgramRecPriorityInfo::ToMap(), ViewScheduleDiff::updateInfo(), ViewScheduled::updateInfo(), GuideGrid::updateInfo(), IdleScreen::UpdateScreen(), WelcomeDialog::updateScreen(), ViewScheduleDiff::updateUIList(), and PlaybackBox::UpdateUIListItem(). Definition at line 5280 of file programinfo.cpp. Referenced by JobQueue::GetJobCommand(), RecordingInfo::operator=(), MythSystemEventHandler::SubstituteMatches(), and RecordingInfo::SubstituteMatches(). Definition at line 2237 of file programinfo.cpp. Referenced by PlayerContext::IsSameProgram(), IsSameProgramAndStartTime(), and TestProgramInfo::movieComparison_test(). Definition at line 2168 of file programinfo.cpp. Definition at line 2295 of file programinfo.cpp. Definition at line 2311 of file programinfo.cpp. Definition at line 2328 of file programinfo.cpp. Definition at line 306 of file programinfo.h. Definition at line 2356 of file programinfo.cpp. Definition at line 2157 of file programinfo.cpp. Definition at line 314 of file programinfo.h. Definition at line 2346 of file programinfo.cpp. Definition at line 321 of file programinfo.h. Definition at line 1874 of file programinfo.cpp. Referenced by TestProgramInfo::programFromVideo_test(), and PlayerContext::SetPlayingInfo(). Definition at line 4758 of file programinfo.cpp. Definition at line 325 of file programinfo.h. Referenced by ClearBookmarks(), ClearSeekTable(), AutoExpire::ExpireRecordings(), FillProgramInfo(), Scheduler::FillRecordingDir(), PreviewGeneratorQueue::GeneratePreviewImage(), get_filename(), GetPlaybackURL(), PlayerContext::GetPlayingInfoMap(), PreviewGeneratorQueue::GetPreviewImage(), TVRec::GetProgramRingBufferForLiveTV(), TV::GetStatus(), MainServer::HandleQueryRecordings(), Scheduler::HandleRecording(), ImportRecorder::Open(), print_comm_flag_output(), TestProgramInfo::programFromVideo_test(), TV::QuickRecord(), ImportRecorder::run(), PreviewGenerator::Run(), RunCCExtract(), PreviewGenerator::RunReal(), TVRec::StartedRecording(), TVRec::SwitchRecordingRingBuffer(), RecordingSelector::titleChanged(), and TVRec::TuningNewRecorder(). Definition at line 326 of file programinfo.h. Definition at line 327 of file programinfo.h. Definition at line 329 of file programinfo.h. Definition at line 333 of file programinfo.h. Definition at line 338 of file programinfo.h. Definition at line 340 of file programinfo.h. Referenced by Dvr::DeleteRecording(), PlaybackSock::FillProgramInfo(), PlaybackSock::GetRecording(), MainServer::HandleGenPreviewPixmap(), RemoteFillProgramInfo(), TV::StartTV(), Dvr::UnDeleteRecording(), and Dvr::UpdateRecordedWatchedStatus(). Definition at line 4833 of file programinfo.cpp. Referenced by RecordingInfo::AddHistory(), Scheduler::AddNewRecords(), Scheduler::AddRecording(), TV::AskAllowRecording(), Scheduler::AssignGroupInput(), RecordingRule::AssignProgramInfo(), ScheduledRecording::BuildCheckRequest(), Scheduler::BuildListMaps(), comp_overlap(), comp_priority(), comp_redundant(), comp_retry(), LookerUpper::CopyRuleInetrefsToRecordings(), RecMetadataEdit::Create(), CreateProgramInfoString(), PlaybackBox::CreateProgramInfoString(), CustomEdit::CustomEdit(), StatusBox::customEvent(), LookerUpper::customEvent(), ProgFinder::customEvent(), ProgramRecPriority::deactivate(), ProgLister::DeleteOldSeries(), StatusBox::doAutoExpireList(), MainServer::DoHandleDeleteRecording(), StatusBox::doJobQueueStatus(), StatusBox::doTunerStatus(), CustomEdit::evaluate(), MythBDPlayer::EventStart(), AutoExpire::ExpireRecordings(), extract_subtitle(), ProgLister::FillItemList(), TV::FillOSDMenuJumpRec(), FillProgramInfo(), HttpStatus::FillProgramInfo(), GuideUpdateProgramRow::fillProgramRowInfosWith(), Scheduler::FindNextConflict(), TVRec::FinishedRecording(), FlagCommercials(), GuideGrid::gestureEvent(), PlayGroup::GetInitialName(), Dvr::GetRecordedList(), RecordingSelector::getRecordingList(), TV::GetStatus(), LookerUpper::HandleAllArtwork(), LookerUpper::HandleAllRecordingRules(), LookerUpper::HandleAllRecordings(), Scheduler::HandleRecording(), ProgLister::HandleVisible(), Scheduler::HandleWakeSlave(), PlaybackBox::ItemLoaded(), GuideGrid::keyPressEvent(), CustomEdit::loadClauses(), CustomPriority::loadData(), ProgDetails::loadPage(), MetadataFactory::Lookup(), LookupFromProgramInfo(), Scheduler::MarkOtherShowings(), TV::MenuItemDisplayPlayback(), RecordingSelector::OKPressed(), TV::Playback(), print_comm_flag_output(), TestProgramInfo::programFromVideo_test(), Scheduler::PutInactiveSlavesToSleep(), TV::QuickRecord(), RebuildSeekTable(), CustomEdit::recordClicked(), RemoteGetExistingRecorder(), RemoteGetRecordingStatus(), PlaybackBox::saveRecMetadata(), Scheduler::SchedNewFirstPass(), PlayerContext::SetPseudoLiveTV(), ProgLister::ShowDeleteOldEpisodeMenu(), ProgLister::ShowDeleteOldSeriesMenu(), TV::ShowLCDChannelInfo(), TV::ShowOSDPromptDeleteRecording(), ScheduleCommon::ShowPrevious(), PlaybackBox::ShowRecordedEpisodes(), ScheduleCommon::ShowUpcoming(), ScheduleCommon::ShowUpcomingScheduled(), Scheduler::SlaveConnected(), Scheduler::SlaveDisconnected(), TVRec::StartRecording(), TV::timerEvent(), RecordingSelector::titleChanged(), Scheduler::TryAnotherShowing(), TVRec::TuningRestartRecorder(), TVRec::TuningSignalCheck(), RecordingSelector::updateRecordingList(), PlaybackBox::UpdateUIListItem(), and PlaybackBox::UpdateUILists(). Definition at line 344 of file programinfo.h. Referenced by RecordingRule::AssignProgramInfo(), ScheduledRecording::BuildCheckRequest(), comp_priority(), comp_retry(), LookerUpper::CopyRuleInetrefsToRecordings(), RecMetadataEdit::Create(), CreateProgramInfoString(), PlaybackBox::CreateProgramInfoString(), LookerUpper::customEvent(), StatusBox::doTunerStatus(), ScheduleCommon::EditRecording(), CustomEdit::evaluate(), extract_subtitle(), ProgLister::FillItemList(), TV::FillOSDMenuJumpRec(), FillProgramInfo(), HttpStatus::FillProgramInfo(), FlagCommercials(), TV::GetStatus(), GuessLookupType(), LookerUpper::HandleAllArtwork(), LookerUpper::HandleAllRecordingRules(), LookerUpper::HandleAllRecordings(), ProgLister::HandleVisible(), CustomEdit::loadClauses(), ProgDetails::loadPage(), MetadataFactory::Lookup(), LookupFromProgramInfo(), TV::MenuItemDisplayPlayback(), RecordingSelector::OKPressed(), TV::Playback(), TestProgramInfo::programFromVideo_test(), RebuildSeekTable(), RemoteGetRecordingStatus(), Scheduler::SchedNewFirstPass(), TV::ShowLCDChannelInfo(), TV::ShowOSDPromptDeleteRecording(), RecordingSelector::titleChanged(), TVRec::TuningSignalCheck(), ProgramRecPriority::UpdateList(), and RecordingSelector::updateRecordingList(). Definition at line 345 of file programinfo.h. Referenced by RecordingRule::AssignProgramInfo(), ScheduledRecording::BuildCheckRequest(), comp_priority(), comp_retry(), RecMetadataEdit::Create(), ScheduleCommon::EditRecording(), CustomEdit::evaluate(), FillProgramInfo(), HttpStatus::FillProgramInfo(), ProgDetails::loadPage(), LookupFromProgramInfo(), RecordingSelector::OKPressed(), TestProgramInfo::programFromVideo_test(), Scheduler::SchedNewFirstPass(), ProgLister::ShowOldRecordedMenu(), RecordingSelector::titleChanged(), and RecordingSelector::updateRecordingList(). Definition at line 346 of file programinfo.h. Referenced by RecordingRule::AssignProgramInfo(), comp_season(), comp_season_rev(), MetadataOptions::Create(), RecMetadataEdit::Create(), CustomEdit::evaluate(), FillProgramInfo(), PlayerContext::GetPlayingInfoMap(), Content::GetRecordingArtworkList(), GuessLookupType(), LookerUpper::HandleAllArtwork(), LookerUpper::HandleAllRecordings(), ProgDetails::loadPage(), MetadataFactory::Lookup(), LookupFromProgramInfo(), TestProgramInfo::programFromVideo_test(), ToMap(), PlaybackBox::updateGroupInfo(), RecordingSelector::updateRecordingList(), and PlaybackBox::UpdateUIListItem(). Definition at line 347 of file programinfo.h. Referenced by RecordingRule::AssignProgramInfo(), comp_season(), comp_season_rev(), MetadataOptions::Create(), RecMetadataEdit::Create(), CustomEdit::evaluate(), FillProgramInfo(), GuessLookupType(), LookerUpper::HandleAllRecordings(), ProgDetails::loadPage(), MetadataFactory::Lookup(), LookupFromProgramInfo(), TestProgramInfo::programFromVideo_test(), ToMap(), and RecordingSelector::updateRecordingList(). Referenced by RecordingRule::AssignProgramInfo(), CustomEdit::evaluate(), FillProgramInfo(), HttpStatus::FillProgramInfo(), GuideUpdateProgramRow::fillProgramRowInfosWith(), PlayGroup::GetInitialName(), TVRec::GetRecordEndTime(), RecordingRule::LoadByProgram(), CustomEdit::loadClauses(), ProgDetails::loadPage(), LookupFromProgramInfo(), ProgramRecPriority::newTemplate(), ProgramRecPriority::remove(), and PlaybackBox::UpdateUILists(). Definition at line 352 of file programinfo.h. Referenced by Content::AddRecordingLiveStream(), LiveTVChain::AppendNewProgram(), TV::AskAllowRecording(), Scheduler::AssignGroupInput(), RecordingRule::AssignProgramInfo(), TVBrowseHelper::BrowseStart(), TV::ChangeChannel(), CheckRecordings(), ClearBookmarks(), ClearSeekTable(), ClearSkipList(), RecordingInfo::clone(), comp_overlap(), comp_priority(), comp_recstart(), comp_retry(), CompleteJob(), CopySkipListToCutList(), PlaybackBox::createJobMenu(), PlaybackBox::createPlaylistJobMenu(), MainServer::customEvent(), PlaybackBox::customEvent(), TV::customEvent(), commDetector2::debugDirectory(), ProgLister::DeleteOldEpisode(), LiveTVChain::DeleteProgram(), Dvr::DeleteRecording(), MainServer::DoDeleteThread(), TV::DoEditSchedule(), DoFlagCommercials(), MainServer::DoHandleDeleteRecording(), PlaybackBox::doJobQueueJob(), StatusBox::doJobQueueStatus(), PlaybackBox::doPlaylistJobQueueJob(), TV::DoQueueTranscode(), StatusBox::doTunerStatus(), LiveTVChain::EntryToProgram(), CustomEdit::evaluate(), MythPlayer::EventLoop(), PlaybackBox::extract_commflag_state(), PlaybackBox::extract_job_state(), FillCastMemberList(), HttpStatus::FillChannelInfo(), FillCommBreak(), FillCutList(), AutoExpire::FillDBOrdered(), FillProgramInfo(), PlaybackSock::FillProgramInfo(), Scheduler::FillRecordingDir(), FillSeek(), HttpStatus::FillStatusXML(), Scheduler::FindNextConflict(), LiveTVChain::FinishedRecording(), TVRec::FinishedRecording(), FlagCommercials(), GetMarkupList(), GetPlaybackURL(), PlayerContext::GetPlayingInfoMap(), Content::GetPreviewImage(), GetProgramInfo(), getProgramInfoForFile(), RemoteEncoder::GetRecording(), Content::GetRecording(), PlaybackSock::GetRecording(), JobQueue::GetRunningJobID(), TV::GetStatus(), MainServer::HandleAnnounce(), TV::HandlePseudoLiveTVTimerEvent(), MainServer::HandleQueryRecording(), Scheduler::HandleRecording(), Scheduler::HandleRecordingStatusChange(), MainServer::HandleStopRecording(), MainServer::HandleUndeleteRecording(), incomingCustomEvent(), init_jobs(), RecordingInfo::InsertProgram(), TVRec::IsBusy(), Scheduler::IsBusyRecording(), JobQueue::IsJobRunning(), EncoderLink::IsRecording(), TV::ITVRestart(), ProgDetails::loadPage(), FileServerHandler::LocalFilePath(), MainServer::LocalFilePath(), LookupFromProgramInfo(), main(), MythPlayer::OpenFile(), plTimeSort::operator()(), TV::PlaybackMenuInit(), Frontend::PlayRecording(), preview_helper(), print_comm_flag_output(), JobQueue::ProcessJob(), PlaybackBox::processNetworkControlCommand(), TV::ProcessNetworkControlCommand(), LiveTVChain::ProgramIsAt(), QueueCommFlagJob(), QueueJob(), JobQueue::QueueRecordingJobs(), QueueTranscodeJob(), TV::QuickRecord(), Reload(), ReloadBookmark(), RemoteDeleteRecording(), RemoteFillProgramInfo(), RemoteUndeleteRecording(), ProgramInfoCache::Remove(), PreviewGenerator::Run(), TVBrowseHelper::run(), SendMythSystemPlayEvent(), SendMythSystemRecEvent(), SetCutList(), TVRec::SetLiveRecording(), LiveTVChain::SetProgram(), RecorderBase::SetRecordingStatus(), ScheduleCommon::ShowChannelSearch(), ProgFinder::ShowGuide(), ScheduleCommon::ShowGuide(), ScheduleCommon::ShowUpcoming(), EncoderLink::StartRecording(), TVRec::StartRecording(), TV::StartTV(), PlaybackBox::stopPlaylistJobQueueJob(), Dvr::StopRecording(), MythSystemEventHandler::SubstituteMatches(), TVRec::SwitchRecordingRingBuffer(), toString(), Scheduler::TryAnotherShowing(), TVRec::TuningNewRecorder(), TVRec::TuningRestartRecorder(), TVRec::TuningSignalCheck(), Dvr::UnDeleteRecording(), Dvr::UpdateRecordedWatchedStatus(), Scheduler::UpdateRecStatus(), and WaitToDelete(). Referenced by TVBrowseHelper::BrowseStart(), comp_recstart(), comp_redundant(), TV::DoEditSchedule(), StatusBox::doJobQueueStatus(), CustomEdit::evaluate(), HttpStatus::FillChannelInfo(), TV::HandlePseudoLiveTVTimerEvent(), LookupFromProgramInfo(), MythPlayer::OpenFile(), Scheduler::PrintRec(), PlayerContext::SetPseudoLiveTV(), ProgFinder::ShowGuide(), and ScheduleCommon::ShowGuide(). Definition at line 363 of file programinfo.h. Referenced by Scheduler::AssignGroupInput(), RecordingRule::AssignProgramInfo(), comp_recstart(), comp_redundant(), CustomEdit::evaluate(), HttpStatus::FillChannelInfo(), CustomEdit::loadClauses(), ViewScheduled::LoadList(), LookupFromProgramInfo(), TV::Playback(), Scheduler::PrintRec(), TV::ShowLCDChannelInfo(), Scheduler::SlaveConnected(), and Scheduler::SlaveDisconnected(). Definition at line 366 of file programinfo.h. Definition at line 367 of file programinfo.h. Definition at line 370 of file programinfo.h. Referenced by RecordingInfo::AddHistory(), Scheduler::AddNewRecords(), RecordingRule::AssignProgramInfo(), TVBrowseHelper::BrowseStart(), ClearBookmarks(), ClearSeekTable(), RecordingInfo::clone(), comp_originalAirDate(), comp_originalAirDate_rev(), comp_overlap(), comp_recordDate(), comp_recordDate_rev(), comp_redundant(), ProgLister::DeleteOldEpisode(), DoFlagCommercials(), CustomEdit::evaluate(), FillCastMemberList(), FillProgramInfo(), HttpStatus::FillProgramInfo(), GuideUpdateProgramRow::fillProgramRowInfosWith(), TVRec::FinishedRecording(), GuideGrid::gestureEvent(), get_start(), TVBrowseHelper::GetNextProgramDB(), GuideGrid::keyPressEvent(), RecordingRule::LoadBySearch(), ViewScheduled::LoadList(), ProgDetails::loadPage(), PreviewGenerator::LocalPreviewRun(), LookupFromProgramInfo(), RecordingSelector::OKPressed(), plTitleSort::operator()(), plPrevTitleSort::operator()(), plTimeSort::operator()(), TV::PlaybackMenuInit(), TV::ProcessNetworkControlCommand(), RecordingInfo::RecordingInfo(), RemoteGetRecordingStatus(), TVRec::SetLiveRecording(), RecorderBase::SetRecording(), RecorderBase::SetRecordingStatus(), ScheduleCommon::ShowChannelSearch(), ProgFinder::ShowGuide(), ScheduleCommon::ShowGuide(), Scheduler::SlaveConnected(), RecordingSelector::titleChanged(), toString(), Scheduler::TryAnotherShowing(), TVRec::TuningNewRecorder(), TVRec::TuningSignalCheck(), RecordingSelector::updateRecordingList(), and Scheduler::UpdateRecStatus(). Definition at line 372 of file programinfo.h. Definition at line 377 of file programinfo.h. Referenced by LiveTVChain::AppendNewProgram(), RecordingInfo::ApplyNeverRecord(), Scheduler::AssignGroupInput(), CheckRecordings(), RecordingInfo::clone(), comp_originalAirDate(), comp_originalAirDate_rev(), comp_priority(), comp_programid(), comp_programid_rev(), comp_recordDate(), comp_recordDate_rev(), comp_recpriority2(), comp_recstart(), comp_retry(), CompleteJob(), PlaybackBox::createJobMenu(), PlaybackBox::createPlaylistJobMenu(), CreateProgramInfoString(), PlaybackBox::CreateProgramInfoString(), ScheduleCommon::customEvent(), TV::customEvent(), LiveTVChain::DeleteProgram(), Dvr::DeleteRecording(), StatusBox::doAutoExpireList(), DoFlagCommercials(), MainServer::DoHandleDeleteRecording(), PlaybackBox::doJobQueueJob(), StatusBox::doJobQueueStatus(), PlaybackBox::doPlaylistJobQueueJob(), TV::DoQueueTranscode(), ScheduleCommon::EditRecording(), PlaybackBox::extract_commflag_state(), PlaybackBox::extract_job_state(), ViewScheduled::FillList(), FillProgramInfo(), HttpStatus::FillProgramInfo(), Scheduler::FillRecordingDir(), Scheduler::FindNextConflict(), LiveTVChain::FinishedRecording(), TVRec::FinishedRecording(), PreviewGeneratorQueue::GeneratePreviewImage(), GetPlaybackURL(), TVRec::GetProgramRingBufferForLiveTV(), JobQueue::GetRunningJobID(), TV::GetStatus(), Scheduler::HandleRecording(), Scheduler::HandleRecordingStatusChange(), Scheduler::HandleReschedule(), Scheduler::HandleWakeSlave(), incomingCustomEvent(), init_jobs(), JobQueue::IsJobRunning(), EncoderLink::IsRecording(), ViewScheduled::LoadList(), ProgDetails::loadPage(), PreviewGenerator::LocalPreviewRun(), LookupFromProgramInfo(), Scheduler::MarkShowingsList(), Frontend::PlayRecording(), print_comm_flag_output(), AutoExpire::PrintExpireList(), Scheduler::PrintList(), Scheduler::PrintRec(), TV::ProcessNetworkControlCommand(), LiveTVChain::ProgramIsAt(), Scheduler::PutInactiveSlavesToSleep(), QueueCommFlagJob(), QueueJob(), JobQueue::QueueRecordingJobs(), QueueTranscodeJob(), ReloadBookmark(), RemoteDeleteRecording(), RemoteUndeleteRecording(), ProgramInfoCache::Remove(), PreviewGenerator::Run(), Scheduler::SchedNewFirstPass(), Scheduler::SchedNewRetryPass(), SendMythSystemPlayEvent(), SendMythSystemRecEvent(), LiveTVChain::SetProgram(), PlayerContext::SetPseudoLiveTV(), MythPlayer::SetWatched(), ViewScheduleDiff::showStatus(), Scheduler::ShutdownServer(), EncoderLink::StartRecording(), TVRec::StartRecording(), PlaybackBox::stopPlaylistJobQueueJob(), Dvr::StopRecording(), ToMap(), toString(), Scheduler::TryAnotherShowing(), TVRec::TuningRestartRecorder(), Dvr::UnDeleteRecording(), Scheduler::UpdateNextRecord(), WaitToDelete(), and EncoderLink::WouldConflict(). Definition at line 386 of file programinfo.h. Definition at line 392 of file programinfo.h. Definition at line 395 of file programinfo.h. Definition at line 399 of file programinfo.h. Definition at line 400 of file programinfo.h. Definition at line 401 of file programinfo.h. Definition at line 402 of file programinfo.h. Definition at line 403 of file programinfo.h. Referenced by LookerUpper::customEvent(), MetadataOptions::customEvent(), FillProgramInfo(), LookupFromProgramInfo(), and TestProgramInfo::programFromVideo_test(). Definition at line 408 of file programinfo.h. Definition at line 409 of file programinfo.h. Definition at line 410 of file programinfo.h. Definition at line 6158 of file programinfo.cpp. Referenced by CheckRecordings(), PlaybackBox::customEvent(), StatusBox::doAutoExpireList(), MainServer::DoDeleteThread(), LiveTVChain::DoGetNextProgram(), AutoExpire::ExpireRecordings(), extract_main_state(), FillCastMemberList(), FillProgramInfo(), HttpStatus::FillProgramInfo(), RecordingInfo::GetFilesize(), RecordingInfo::GetRecordingFile(), MainServer::HandleQueryRecordings(), ProgDetails::loadPage(), RecordingSelector::OKPressed(), PlaybackBox::Play(), AutoExpire::PrintExpireList(), RecordingSelector::titleChanged(), UpdateFileSize(), PlaybackBox::updateGroupInfo(), and RecordingSelector::updateRecordingList(). Definition at line 416 of file programinfo.h. Referenced by RecordingRule::AssignProgramInfo(), ScheduledRecording::BuildCheckRequest(), comp_priority(), comp_programid(), comp_programid_rev(), comp_retry(), ScheduleCommon::EditRecording(), CustomEdit::evaluate(), FillProgramInfo(), HttpStatus::FillProgramInfo(), TV::GetStatus(), CustomEdit::loadClauses(), ProgDetails::loadPage(), LookupFromProgramInfo(), plPrevTitleSort::operator()(), TestProgramInfo::programFromVideo_test(), and Scheduler::SchedNewFirstPass(). Definition at line 417 of file programinfo.h. Referenced by RecordingRule::AssignProgramInfo(), LookerUpper::CopyRuleInetrefsToRecordings(), RecMetadataEdit::Create(), FillProgramInfo(), PlayerContext::GetPlayingInfoMap(), Content::GetRecordingArtworkList(), GuessLookupType(), LookerUpper::HandleAllArtwork(), LookerUpper::HandleAllRecordingRules(), LookerUpper::HandleAllRecordings(), MetadataFactory::Lookup(), LookupFromProgramInfo(), TestProgramInfo::programFromVideo_test(), Testvideometadata::ProgramWithInetref(), PlaybackBox::updateGroupInfo(), and PlaybackBox::UpdateUIListItem(). Definition at line 418 of file programinfo.h. Definition at line 1882 of file programinfo.cpp. Referenced by ProgramRecPriority::changeRecPriority(), comp_priority(), comp_recstart(), comp_retry(), FillProgramInfo(), HttpStatus::FillProgramInfo(), TitleSort::operator()(), ProgramRecPrioritySort::operator()(), ProgramRecTypeSort::operator()(), AutoExpire::PrintExpireList(), Scheduler::PrintRec(), ProgramRecPriority::saveRecPriority(), ProgramRecPriority::scheduleChanged(), Scheduler::TryAnotherShowing(), ProgramRecPriority::updateInfo(), ProgramRecPriority::UpdateList(), and PlaybackBox::UpdateUILists(). Definition at line 423 of file programinfo.h. Definition at line 426 of file programinfo.h. Referenced by RecordingInfo::AddHistory(), Scheduler::AddNewRecords(), Scheduler::AddRecording(), Scheduler::AssignGroupInput(), Scheduler::BackupRecStatus(), DTVRecorder::BufferedWrite(), ScheduledRecording::BuildCheckRequest(), Scheduler::BuildListMaps(), Scheduler::BuildWorkList(), Scheduler::ChangeRecordingEnd(), comp_overlap(), comp_priority(), comp_recstart(), comp_redundant(), comp_retry(), StatusBox::doScheduleStatus(), ScheduleCommon::EditRecording(), PlaybackBox::extract_job_state(), extract_main_state(), ViewScheduleDiff::fillList(), ViewScheduled::FillList(), FillProgramInfo(), HttpStatus::FillProgramInfo(), GuideUpdateProgramRow::fillProgramRowInfosWith(), Scheduler::FillRecordingDir(), TVRec::FinishedRecording(), Scheduler::GetRecStatus(), Scheduler::HandleRecording(), Scheduler::HandleRecordingStatusChange(), Scheduler::HandleReschedule(), MainServer::HandleStopRecording(), DTVRecorder::HandleTimestamps(), ProgLister::HandleVisible(), Scheduler::IsBusyRecording(), ViewScheduled::LoadList(), ProgDetails::loadPage(), Scheduler::MarkShowingsList(), plTitleSort::operator()(), Scheduler::PrintRec(), Scheduler::PruneRedundants(), Scheduler::PutInactiveSlavesToSleep(), Recording(), RemoteGetCurrentlyRecordingList(), Scheduler::SchedNewRetryPass(), SendMythSystemRecEvent(), TVRec::SetLiveRecording(), RecorderBase::SetRecordingStatus(), PlaybackBox::ShowActionPopup(), ViewScheduleDiff::showStatus(), Scheduler::SlaveConnected(), Scheduler::SlaveDisconnected(), TVRec::StartRecording(), ToMap(), Scheduler::TryAnotherShowing(), TVRec::TuningShutdowns(), ProgramRecPriority::updateInfo(), ProgramRecPriority::UpdateList(), Scheduler::UpdateNextRecord(), Scheduler::UpdateRecStatus(), IdleScreen::UpdateScreen(), and ViewScheduleDiff::updateUIList(). Referenced by Scheduler::AddNewRecords(), Scheduler::AddRecording(), ScheduledRecording::BuildCheckRequest(), Scheduler::BuildListMaps(), Scheduler::ChangeRecordingEnd(), comp_overlap(), comp_priority(), comp_redundant(), comp_retry(), LookerUpper::CopyRuleInetrefsToRecordings(), ProgramRecPriority::deactivate(), GuideGrid::deleteRule(), ProgramRecPriority::edit(), ProgramRecPriority::FillList(), FillProgramInfo(), HttpStatus::FillProgramInfo(), GuessLookupType(), Scheduler::HandleRecordingStatusChange(), RecordingRule::LoadByProgram(), CustomEdit::loadData(), ViewScheduled::LoadList(), ProgDetails::loadPage(), ScheduleCommon::MakeOverride(), Scheduler::MarkOtherShowings(), TitleSort::operator()(), ProgramRecPrioritySort::operator()(), ProgramRecTypeSort::operator()(), Scheduler::PruneOverlaps(), Scheduler::PruneRedundants(), ScheduleCommon::QuickRecord(), ProgramRecPriority::remove(), ProgramRecPriority::RemoveItemFromList(), ProgramRecPriority::saveRecPriority(), Scheduler::SchedNewFirstPass(), ProgramRecPriority::scheduleChanged(), ScheduleEditor::ScheduleEditor(), ProgLister::ShowDeleteRuleMenu(), ProgLister::ShowMenu(), ScheduleCommon::ShowPrevious(), GuideGrid::ShowRecordingMenu(), ScheduleCommon::ShowUpcoming(), ScheduleCommon::ShowUpcomingScheduled(), TVRec::StartRecording(), Scheduler::TryAnotherShowing(), ProgramRecPriority::updateInfo(), ProgramRecPriority::UpdateList(), Scheduler::UpdateNextRecord(), and PlaybackBox::UpdateUILists(). Definition at line 431 of file programinfo.h. Definition at line 436 of file programinfo.h. Definition at line 440 of file programinfo.h. Definition at line 444 of file programinfo.h. Referenced by Scheduler::AddNewRecords(), Scheduler::AddRecording(), Scheduler::AssignGroupInput(), Scheduler::BuildListMaps(), Scheduler::ChangeRecordingEnd(), comp_overlap(), comp_priority(), comp_retry(), StatusBox::doScheduleStatus(), HttpStatus::FillChannelInfo(), ViewScheduleDiff::fillList(), ViewScheduled::FillList(), FillProgramInfo(), HttpStatus::FillProgramInfo(), Scheduler::FillRecordingDir(), Scheduler::FindConflict(), Scheduler::FindNextConflict(), TVRec::FinishedRecording(), Scheduler::HandleRecording(), Scheduler::HandleWakeSlave(), Scheduler::IsBusyRecording(), ViewScheduled::LoadList(), Scheduler::PrintRec(), Scheduler::PutInactiveSlavesToSleep(), TVRec::RecordPending(), Scheduler::SchedLiveTV(), Scheduler::SchedNewRetryPass(), SendMythSystemRecEvent(), TVRec::SetLiveRecording(), RecorderBase::SetRecordingStatus(), Scheduler::SlaveConnected(), Scheduler::SlaveDisconnected(), TVRec::StartRecording(), Scheduler::TryAnotherShowing(), TVRec::TuningNewRecorder(), TVRec::TuningSignalCheck(), Scheduler::UpdateRecStatus(), and ViewScheduleDiff::updateUIList(). Definition at line 445 of file programinfo.h. Referenced by FillProgramInfo(), RecordingInfo::InsertProgram(), and ProgDetails::loadPage(). Definition at line 446 of file programinfo.h. Definition at line 449 of file programinfo.h. Referenced by RecordingRule::AssignProgramInfo(), ScheduledRecording::BuildCheckRequest(), comp_overlap(), ScheduleCommon::EditRecording(), ProgDetails::loadPage(), and Scheduler::MarkOtherShowings(). Definition at line 453 of file programinfo.h. Definition at line 1908 of file programinfo.cpp. Definition at line 458 of file programinfo.h. Definition at line 459 of file programinfo.h. Definition at line 461 of file programinfo.h. Definition at line 463 of file programinfo.h. Referenced by ClearBookmarks(), ClearMarkupMap(), ClearPositionMap(), ClearSeekTable(), getCutFrames(), GetPlaybackURL(), internal_play_media(), MythPlayer::IsNearEnd(), TestProgramInfo::programFromVideo_test(), QueryKeyFrameInfo(), QueryMarkup(), QueryMarkupMap(), QueryPositionMap(), SaveMarkup(), SaveMarkupMap(), SavePositionMap(), SavePositionMapDelta(), TV::ShowOSDStopWatchingRecording(), and ToMap(). Definition at line 466 of file programinfo.h. Definition at line 468 of file programinfo.h. Referenced by ProgLister::customEvent(), ProgLister::ShowOldRecordedMenu(), and ToMap(). Definition at line 1917 of file programinfo.cpp. Referenced by PlaybackBox::deleteSelected(), StatusBox::doAutoExpireList(), JobQueue::DoFlagCommercialsThread(), LiveTVChain::DoGetNextProgram(), MainServer::DoHandleDeleteRecording(), JobQueue::DoMetadataLookupThread(), JobQueue::DoTranscodeThread(), JobQueue::DoUserJobThread(), ScheduleCommon::EditRecording(), AutoExpire::ExpireRecordings(), extract_subtitle(), PreviewGeneratorQueue::GeneratePreviewImage(), TVRec::GetProgramRingBufferForLiveTV(), MainServer::HandleGenPreviewPixmap(), TV::HandleJumpToProgramAction(), MainServer::HandleQueryRecordings(), Scheduler::HandleRecording(), RecordingInfo::InsertProgram(), ProgDetails::loadPage(), TV::PrepToSwitchToRecordedProgram(), AutoExpire::PrintExpireList(), Scheduler::PrintRec(), SetAvailableStatus(), PlaybackBox::ShowAvailabilityPopup(), ProgLister::ShowOldRecordedMenu(), ViewScheduleDiff::showStatus(), TVRec::StartRecording(), SubstituteMatches(), ToMap(), Scheduler::UpdateRecStatus(), and PlaybackBox::UpdateUIListItem(). Referenced by MythBDPlayer::EventStart(), ProgramRecPriority::scheduleChanged(), and PlaybackBox::UpdateUILists(). Definition at line 492 of file programinfo.h. Definition at line 2437 of file programinfo.cpp. Definition at line 495 of file programinfo.h. Definition at line 496 of file programinfo.h. Definition at line 497 of file programinfo.h. Definition at line 498 of file programinfo.h. Referenced by TVRec::GetProgramRingBufferForLiveTV(), Scheduler::HandleRecording(), UPnpCDSTv::LoadRecordings(), Scheduler::SchedLiveTV(), PlaybackSock::StartRecording(), and TVRec::StartRecording(). Definition at line 499 of file programinfo.h. Definition at line 500 of file programinfo.h. Definition at line 501 of file programinfo.h. Definition at line 502 of file programinfo.h. Definition at line 503 of file programinfo.h. Definition at line 6117 of file programinfo.cpp. Referenced by PlaybackBox::customEvent(), RecordingInfo::GetRecordingFile(), MainServer::HandleQueryRecordings(), and RecordingInfo::SetFilesize(). Definition at line 505 of file programinfo.h. Definition at line 506 of file programinfo.h. Definition at line 538 of file programinfo.h. Definition at line 546 of file programinfo.h. Definition at line 551 of file programinfo.h. Definition at line 552 of file programinfo.h. Referenced by Scheduler::AddNewRecords(), RecordingInfo::ApplyNeverRecord(), Scheduler::AssignGroupInput(), Scheduler::ChangeRecordingEnd(), MainServer::customEvent(), PlaybackBox::customEvent(), MainServer::DoHandleStopRecording(), TVRec::FinishedRecording(), TVRec::GetRecording(), Scheduler::HandleRecording(), Scheduler::HandleRecordingStatusChange(), Scheduler::MarkShowingsList(), TVRec::NotifySchedulerOfRecording(), Scheduler::PruneRedundants(), Scheduler::RestoreRecStatus(), TVRec::RingBufferChanged(), TVRec::run(), Scheduler::SchedLiveTV(), Scheduler::SchedNewFirstPass(), Scheduler::SchedNewRetryPass(), RecorderBase::SetRecordingStatus(), Scheduler::SlaveConnected(), Scheduler::SlaveDisconnected(), TVRec::SwitchRecordingRingBuffer(), TVRec::TeardownRecorder(), Scheduler::TryAnotherShowing(), TVRec::TuningFrequency(), TVRec::TuningNewRecorder(), TVRec::TuningSignalCheck(), and Scheduler::UpdateRecStatus(). Definition at line 553 of file programinfo.h. Definition at line 554 of file programinfo.h. Definition at line 2507 of file programinfo.cpp. Definition at line 2643 of file programinfo.cpp. Definition at line 2721 of file programinfo.cpp. Definition at line 2748 of file programinfo.cpp. Definition at line 2775 of file programinfo.cpp. Definition at line 2792 of file programinfo.cpp. Definition at line 2949 of file programinfo.cpp. Definition at line 2808 of file programinfo.cpp. Definition at line 2885 of file programinfo.cpp. Definition at line 3024 of file programinfo.cpp. Referenced by TV::StartProgramEditMode(), and Transcode::TranscodeFile(). Definition at line 3103 of file programinfo.cpp. Definition at line 3165 of file programinfo.cpp. Definition at line 3182 of file programinfo.cpp. Definition at line 3369 of file programinfo.cpp. Definition at line 3215 of file programinfo.cpp. Definition at line 5153 of file programinfo.cpp. Definition at line 4349 of file programinfo.cpp. Definition at line 4367 of file programinfo.cpp. Definition at line 4372 of file programinfo.cpp. Definition at line 4422 of file programinfo.cpp. Definition at line 4442 of file programinfo.cpp. Definition at line 4867 of file programinfo.cpp. Definition at line 3667 of file programinfo.cpp. Definition at line 4883 of file programinfo.cpp. Definition at line 1888 of file programinfo.cpp. Definition at line 1954 of file programinfo.cpp. Definition at line 6127 of file programinfo.cpp. Referenced by CompleteJob(), JobQueue::DoTranscodeThread(), RecordingInfo::GetRecordingFile(), MainServer::HandleQueryRecordings(), RecordingInfo::SaveFilesize(), and UpdateFileSize(). Definition at line 2668 of file programinfo.cpp. Referenced by CompleteJob(), MainServer::HandleSetBookmark(), MythPlayer::SetBookmark(), and Dvr::SetSavedBookmark(). Definition at line 2841 of file programinfo.cpp. Definition at line 2903 of file programinfo.cpp. Definition at line 3050 of file programinfo.cpp. transFlag value to set transcoded field to. Definition at line 3235 of file programinfo.cpp. Definition at line 2972 of file programinfo.cpp. Definition at line 3075 of file programinfo.cpp. Definition at line 3258 of file programinfo.cpp. Definition at line 3311 of file programinfo.cpp. Definition at line 3284 of file programinfo.cpp. Definition at line 2467 of file programinfo.cpp. Definition at line 4156 of file programinfo.cpp. Definition at line 4275 of file programinfo.cpp. Definition at line 4186 of file programinfo.cpp. Definition at line 4209 of file programinfo.cpp. Definition at line 4241 of file programinfo.cpp. Definition at line 4716 of file programinfo.cpp. Definition at line 3677 of file programinfo.cpp. Definition at line 608 of file programinfo.h. Definition at line 3337 of file programinfo.cpp. Definition at line 4959 of file programinfo.cpp. Definition at line 4767 of file programinfo.cpp. Referenced by MythPlayer::EventLoop(), FileTransfer::FileTransfer(), FileTransfer::GetFileSize(), MythPlayer::GetRawVideoFrame(), FileTransfer::Pause(), FileTransfer::RequestBlock(), MythCCExtractorPlayer::run(), TVRec::run(), FileTransfer::Seek(), FileTransfer::SetTimeout(), FileTransfer::Stop(), MythPlayer::TranscodeGetNextFrame(), MainServer::TruncateAndClose(), FileTransfer::Unpause(), and FileTransfer::WriteBlock(). Definition at line 4784 of file programinfo.cpp. Definition at line 4808 of file programinfo.cpp. Definition at line 4903 of file programinfo.cpp. Definition at line 2545 of file programinfo.cpp. Definition at line 2446 of file programinfo.cpp. Definition at line 3385 of file programinfo.cpp. Referenced by FillCutList(), getCutFrames(), GetMarkupList(), ThumbFinder::loadCutList(), main(), and Transcode::TranscodeFile(). Definition at line 3417 of file programinfo.cpp. Referenced by CopySkipListToCutList(), SetCutList(), and SetMarkupList(). Definition at line 3471 of file programinfo.cpp. Definition at line 3464 of file programinfo.cpp. Definition at line 3731 of file programinfo.cpp. Referenced by ClearSeekTable(), MpegRecorder::Reset(), DTVRecorder::Reset(), NuppelVideoRecorder::Reset(), Transcode::TranscodeFile(), and UpdatePositionMap(). Definition at line 3769 of file programinfo.cpp. Definition at line 3915 of file programinfo.cpp. Definition at line 4037 of file programinfo.cpp. Definition at line 4116 of file programinfo.cpp. Definition at line 4143 of file programinfo.cpp. Definition at line 4134 of file programinfo.cpp. Definition at line 4448 of file programinfo.cpp. Definition at line 4529 of file programinfo.cpp. Definition at line 2703 of file programinfo.cpp. Definition at line 2713 of file programinfo.cpp. Definition at line 5265 of file programinfo.cpp. Definition at line 1268 of file programinfo.cpp. Definition at line 1277 of file programinfo.cpp. Definition at line 1288 of file programinfo.cpp. Definition at line 1310 of file programinfo.cpp. Definition at line 1333 of file programinfo.cpp. Definition at line 4850 of file programinfo.cpp. Definition at line 2759 of file programinfo.cpp. Definition at line 5329 of file programinfo.cpp. Definition at line 5365 of file programinfo.cpp. Definition at line 5393 of file programinfo.cpp. Definition at line 3586 of file programinfo.cpp. Definition at line 3518 of file programinfo.cpp. Definition at line 3477 of file programinfo.cpp. Definition at line 2391 of file programinfo.cpp. 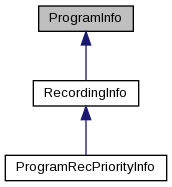 Definition at line 1968 of file programinfo.cpp. beg Iterator pointing to first item in list to treat as beginning of serialized ProgramInfo. Definition at line 1472 of file programinfo.cpp. Definition at line 3603 of file programinfo.cpp. Definition at line 3634 of file programinfo.cpp. Definition at line 5256 of file programinfo.cpp. Definition at line 2451 of file programinfo.cpp. Definition at line 43 of file programinfo.cpp. Definition at line 723 of file programinfo.h. Referenced by RecordingInfo::AddHistory(), RecordingInfo::ApplyRecordRecTitleChange(), TV::AskAllowRecording(), clear(), clone(), RecordingInfo::DeleteHistory(), ProgramRecPriority::FillList(), RecordingInfo::FinishedRecording(), RecordingInfo::ForgetHistory(), FromStringList(), RecordingInfo::InsertProgram(), IsDuplicateProgram(), IsSameProgram(), IsSameProgramWeakCheck(), IsSameTitleStartTimeAndChannel(), IsSameTitleTimeslotAndChannel(), LoadProgramFromRecorded(), ProgramInfo(), RecordingInfo::ReactivateRecording(), RecordingInfo::RecordingInfo(), SaveWatched(), RecordingInfo::SetDupHistory(), RecordingInfo::StartedRecording(), SubstituteMatches(), ProgramRecPriorityInfo::ToMap(), ToMap(), toString(), and ToStringList(). Definition at line 724 of file programinfo.h. Referenced by RecordingInfo::AddHistory(), RecordingInfo::ApplyRecordRecTitleChange(), clear(), clone(), RecordingInfo::FinishedRecording(), RecordingInfo::ForgetHistory(), FromStringList(), RecordingInfo::InsertProgram(), IsDuplicateProgram(), IsGeneric(), IsSameProgram(), LoadProgramFromRecorded(), ProgramInfo(), SaveWatched(), RecordingInfo::SetDupHistory(), SubstituteMatches(), ToMap(), toString(), ToStringList(), ProgramRecPriority::updateInfo(), and ProgramRecPriority::UpdateList(). Definition at line 725 of file programinfo.h. Referenced by RecordingInfo::AddHistory(), RecordingInfo::ApplyRecordRecTitleChange(), clear(), clone(), RecordingInfo::ForgetHistory(), FromStringList(), RecordingInfo::InsertProgram(), IsDuplicateProgram(), IsGeneric(), IsSameProgram(), LoadProgramFromRecorded(), ProgramInfo(), RecordingInfo::SetDupHistory(), SubstituteMatches(), ToMap(), and ToStringList(). Definition at line 726 of file programinfo.h. Referenced by RecordingInfo::AddHistory(), clear(), clone(), FromStringList(), RecordingInfo::InsertProgram(), LoadFromRecorded(), LoadProgramFromRecorded(), ProgramInfo(), SubstituteMatches(), ToMap(), and ToStringList(). Definition at line 727 of file programinfo.h. Definition at line 728 of file programinfo.h. Referenced by clear(), clone(), FromStringList(), LoadFromRecorded(), LoadProgramFromRecorded(), SubstituteMatches(), ToMap(), and ToStringList(). Definition at line 729 of file programinfo.h. Referenced by clear(), clone(), FromStringList(), LoadProgramFromRecorded(), RecordingInfo::RecordingInfo(), SubstituteMatches(), ToMap(), and ToStringList(). Definition at line 730 of file programinfo.h. Referenced by RecordingInfo::AddHistory(), clear(), clone(), FromStringList(), RecordingInfo::InsertProgram(), LoadProgramFromRecorded(), ProgramInfo(), SubstituteMatches(), ProgramRecPriorityInfo::ToMap(), ToMap(), and ToStringList(). Definition at line 731 of file programinfo.h. Referenced by clear(), clone(), ProgramInfo(), and ToMap(). Definition at line 733 of file programinfo.h. Referenced by ProgramRecPriority::changeRecPriority(), clear(), clone(), FromStringList(), LoadProgramFromRecorded(), ProgramInfo(), RecordingInfo::RecordingInfo(), ToMap(), and ToStringList(). Definition at line 735 of file programinfo.h. Referenced by RecordingInfo::AddHistory(), RecordingInfo::ApplyRecordPlayGroupChange(), RecordingInfo::ApplyRecordRecGroupChange(), RecordingInfo::ApplyRecordRecID(), RecordingInfo::ApplyRecordRecTitleChange(), RecordingInfo::ApplyStorageGroupChange(), RecordingInfo::ApplyTranscoderProfileChange(), RecordingInfo::ApplyTranscoderProfileChangeById(), clear(), ClearMarkupMap(), ClearPositionMap(), RecordingInfo::clone(), clone(), CreateRecordBasename(), DiscoverProgramInfoType(), RecordingInfo::FinishedRecording(), RecordingInfo::ForgetHistory(), FromStringList(), RecordingInfo::InsertProgram(), IsSameChannel(), IsSameProgramWeakCheck(), IsSameRecording(), LoadFromOldRecorded(), LoadFromRecorded(), LoadProgramFromProgram(), LoadProgramFromRecorded(), MarkAsInUse(), ProgramInfo(), QueryAutoExpire(), QueryAverageAspectRatio(), QueryAverageFrameRate(), QueryAverageHeight(), QueryAverageWidth(), QueryBookmarkTimeStamp(), QueryCategoryType(), QueryIsEditing(), QueryIsInUse(), QueryJobsRunning(), QueryKeyFrameInfo(), QueryMarkup(), QueryMarkupMap(), QueryMplexID(), QueryPositionMap(), QueryRecordingGroup(), QueryTotalDuration(), QueryTotalFrames(), QueryTranscoderID(), QueryTranscodeStatus(), QueryTuningInfo(), RecordingInfo::RecordingInfo(), Reload(), SaveAspect(), SaveAutoExpire(), SaveBookmark(), SaveCommFlagged(), SaveCutList(), SaveDeletePendingFlag(), SaveEditing(), SaveFrameRate(), SaveInetRef(), SaveMarkup(), SaveMarkupMap(), SavePositionMap(), SavePositionMapDelta(), SavePreserve(), SaveResolution(), SaveSeasonEpisode(), SaveTotalDuration(), SaveTotalFrames(), SaveTranscodeStatus(), SaveVideoProperties(), SaveWatched(), SetPathname(), RecordingInfo::StartedRecording(), SubstituteMatches(), ToMap(), ToStringList(), and RecordingInfo::UpdateRecordingEnd(). Referenced by ChannelText(), clear(), clone(), FromStringList(), LoadProgramFromRecorded(), ProgramInfo(), RecordingInfo::RecordingInfo(), ToMap(), ToStringList(), ProgramRecPriority::updateInfo(), and ProgramRecPriority::UpdateList(). Referenced by RecordingInfo::AddHistory(), ChannelText(), clear(), clone(), RecordingInfo::DeleteHistory(), RecordingInfo::ForgetHistory(), FromStringList(), IsSameChannel(), LoadFromOldRecorded(), LoadFromRecorded(), LoadProgramFromRecorded(), ProgramInfo(), RecordingInfo::ReactivateRecording(), RecordingInfo::RecordingInfo(), ToMap(), ToStringList(), ProgramRecPriority::updateInfo(), and ProgramRecPriority::UpdateList(). Referenced by ChannelText(), clear(), clone(), FromStringList(), LoadFromOldRecorded(), LoadFromRecorded(), LoadProgramFromRecorded(), ProgramInfo(), RecordingInfo::RecordingInfo(), ToMap(), toString(), ToStringList(), ProgramRecPriority::updateInfo(), and ProgramRecPriority::UpdateList(). Referenced by clear(), clone(), FromStringList(), LoadProgramFromRecorded(), ProgramInfo(), RecordingInfo::RecordingInfo(), ToMap(), and ToStringList(). Referenced by RecordingInfo::ApplyRecordRecGroupChange(), clear(), clone(), FromStringList(), RecordingInfo::InsertProgram(), LoadProgramFromRecorded(), QueryRecordingGroup(), SubstituteMatches(), ToMap(), and ToStringList(). Referenced by RecordingInfo::ApplyRecordPlayGroupChange(), clear(), clone(), FromStringList(), RecordingInfo::InsertProgram(), LoadProgramFromRecorded(), SubstituteMatches(), ToMap(), and ToStringList(). Referenced by clear(), ClearMarkupMap(), ClearPositionMap(), clone(), DiscoverProgramInfoType(), DiscoverRecordingDirectory(), FromStringList(), RecordingInfo::InsertProgram(), IsFileReadable(), LoadProgramFromRecorded(), MarkAsInUse(), QueryKeyFrameInfo(), QueryMarkup(), QueryMarkupMap(), QueryPositionMap(), SaveMarkup(), SaveMarkupMap(), SavePositionMap(), SavePositionMapDelta(), SaveWatched(), SetPathname(), RecordingInfo::StartedRecording(), and ToStringList(). Referenced by clear(), clone(), DiscoverRecordingDirectory(), FromStringList(), GetPlaybackURL(), RecordingInfo::InsertProgram(), LoadFromRecorded(), LoadProgramFromRecorded(), MarkAsInUse(), ProgramInfo(), RecordingInfo::RecordingInfo(), RecordingInfo::StartedRecording(), SubstituteMatches(), and ToStringList(). Definition at line 747 of file programinfo.h. Referenced by RecordingInfo::ApplyStorageGroupChange(), clear(), clone(), FromStringList(), GetPlaybackURL(), RecordingInfo::InsertProgram(), LoadProgramFromRecorded(), RecordingInfo::RecordingInfo(), ToMap(), and ToStringList(). Definition at line 749 of file programinfo.h. Referenced by RecordingInfo::AddHistory(), clear(), clone(), FromStringList(), RecordingInfo::InsertProgram(), LoadProgramFromRecorded(), ToMap(), and ToStringList(). Referenced by RecordingInfo::AddHistory(), clear(), clone(), RecordingInfo::ForgetHistory(), FromStringList(), RecordingInfo::InsertProgram(), IsDuplicateProgram(), IsGeneric(), IsSameProgram(), LoadProgramFromRecorded(), ProgramInfo(), RecordingInfo::SetDupHistory(), ToMap(), and ToStringList(). Referenced by RecordingInfo::AddHistory(), clear(), clone(), FromStringList(), RecordingInfo::InsertProgram(), LoadProgramFromRecorded(), ProgramInfo(), SubstituteMatches(), ToMap(), and ToStringList(). Referenced by clear(), clone(), FromStringList(), GetCategoryTypeString(), IsDuplicateProgram(), IsGeneric(), IsSameProgram(), LoadProgramFromRecorded(), RecordingInfo::RecordingInfo(), ToMap(), and ToStringList(). Referenced by clear(), clone(), FromStringList(), LoadProgramFromRecorded(), ToMap(), and ToStringList(). Referenced by RecordingInfo::AddHistory(), clear(), RecordingInfo::clone(), clone(), RecordingInfo::ForgetHistory(), FromStringList(), GetSecondsInRecording(), RecordingInfo::InsertProgram(), IsSameProgramAndStartTime(), IsSameProgramWeakCheck(), IsSameTitleStartTimeAndChannel(), IsSameTitleTimeslotAndChannel(), LoadProgramFromRecorded(), ProgramInfo(), QueryCategoryType(), RecordingInfo::ReactivateRecording(), RecordingInfo::RecordingInfo(), SaveVideoProperties(), RecordingInfo::StartedRecording(), SubstituteMatches(), ToMap(), toString(), and ToStringList(). Referenced by RecordingInfo::AddHistory(), clear(), clone(), FromStringList(), GetSecondsInRecording(), RecordingInfo::InsertProgram(), IsSameTitleTimeslotAndChannel(), LoadProgramFromRecorded(), ProgramInfo(), RecordingInfo::RecordingInfo(), SubstituteMatches(), ToMap(), toString(), and ToStringList(). Definition at line 758 of file programinfo.h. Referenced by RecordingInfo::ApplyRecordPlayGroupChange(), RecordingInfo::ApplyRecordRecGroupChange(), RecordingInfo::ApplyRecordRecID(), RecordingInfo::ApplyRecordRecTitleChange(), RecordingInfo::ApplyStorageGroupChange(), RecordingInfo::ApplyTranscoderProfileChange(), RecordingInfo::ApplyTranscoderProfileChangeById(), clear(), ClearMarkupMap(), ClearPositionMap(), RecordingInfo::clone(), clone(), CreateRecordBasename(), RecordingInfo::DeleteHistory(), RecordingInfo::FinishedRecording(), RecordingInfo::ForgetHistory(), FromStringList(), GetSecondsInRecording(), RecordingInfo::InsertProgram(), IsSameRecording(), LoadFromRecorded(), LoadProgramFromRecorded(), MarkAsInUse(), ProgramInfo(), QueryAutoExpire(), QueryAverageAspectRatio(), QueryAverageFrameRate(), QueryAverageHeight(), QueryAverageWidth(), QueryBookmarkTimeStamp(), QueryIsEditing(), QueryIsInUse(), QueryJobsRunning(), QueryKeyFrameInfo(), QueryMarkup(), QueryMarkupMap(), QueryPositionMap(), QueryRecordingGroup(), QueryTotalDuration(), QueryTotalFrames(), QueryTranscoderID(), QueryTranscodeStatus(), RecordingInfo::RecordingInfo(), Reload(), SaveAspect(), SaveAutoExpire(), SaveBookmark(), SaveCommFlagged(), SaveCutList(), SaveDeletePendingFlag(), SaveEditing(), SaveFrameRate(), SaveInetRef(), SaveMarkup(), SaveMarkupMap(), SavePositionMap(), SavePositionMapDelta(), SavePreserve(), SaveResolution(), SaveSeasonEpisode(), SaveTotalDuration(), SaveTotalFrames(), SaveTranscodeStatus(), SaveWatched(), RecordingInfo::StartedRecording(), SubstituteMatches(), ToMap(), toString(), ToStringList(), UpdateLastDelete(), and RecordingInfo::UpdateRecordingEnd(). Referenced by clear(), clone(), RecordingInfo::FinishedRecording(), FromStringList(), RecordingInfo::InsertProgram(), LoadProgramFromRecorded(), ProgramInfo(), RecordingInfo::RecordingInfo(), SubstituteMatches(), ToMap(), toString(), ToStringList(), and RecordingInfo::UpdateRecordingEnd(). Referenced by clear(), clone(), FromStringList(), RecordingInfo::InsertProgram(), LoadProgramFromRecorded(), RecordingInfo::RecordingInfo(), ToMap(), and ToStringList(). Referenced by clear(), clone(), FromStringList(), RecordingInfo::InsertProgram(), LoadProgramFromRecorded(), ProgramInfo(), RecordingInfo::RecordingInfo(), SubstituteMatches(), ToMap(), and ToStringList(). Definition at line 763 of file programinfo.h. Referenced by clear(), clone(), FromStringList(), LoadProgramFromRecorded(), RecordingInfo::RecordingInfo(), ToMap(), and ToStringList(). Referenced by clear(), clone(), LoadProgramFromRecorded(), MarkAsInUse(), and UpdateInUseMark(). Referenced by clear(), clone(), and LoadProgramFromRecorded(). Referenced by RecordingInfo::AddHistory(), clear(), clone(), RecordingInfo::DeleteHistory(), RecordingInfo::ForgetHistory(), FromStringList(), RecordingInfo::getRecordID(), RecordingInfo::InsertProgram(), IsDuplicateProgram(), LoadProgramFromRecorded(), ProgramInfo(), RecordingInfo::RecordingInfo(), SaveInetRef(), SaveSeasonEpisode(), ToStringList(), and UpdateLastDelete(). Definition at line 770 of file programinfo.h. Referenced by RecordingInfo::AddHistory(), RecordingInfo::ApplyRecordRecID(), clear(), clone(), RecordingInfo::DeleteHistory(), RecordingInfo::ForgetHistory(), FromStringList(), RecordingInfo::InsertProgram(), IsDuplicateProgram(), LoadProgramFromRecorded(), RecordingInfo::RecordingInfo(), RecordingInfo::SubstituteMatches(), and ToStringList(). Referenced by clear(), clone(), FromStringList(), LoadProgramFromRecorded(), QueryTuningInfo(), RecordingInfo::RecordingInfo(), and ToStringList(). Referenced by clear(), clone(), FromStringList(), LoadProgramFromRecorded(), ProgramInfo(), QueryTuningInfo(), RecordingInfo::RecordingInfo(), ToMap(), and ToStringList(). Referenced by RecordingInfo::AddHistory(), clear(), clone(), RecordingInfo::DeleteHistory(), RecordingInfo::ForgetHistory(), FromStringList(), RecordingInfo::InsertProgram(), IsDuplicateProgram(), LoadProgramFromRecorded(), ProgramInfo(), RecordingInfo::RecordingInfo(), RecordingInfo::SetDupHistory(), RecordingInfo::SubstituteMatches(), and ToStringList(). Referenced by clear(), clone(), FromStringList(), LoadProgramFromRecorded(), MarkAsInUse(), ProgramInfo(), QueryBDBookmark(), QueryBookmark(), QueryDVDBookmark(), QueryIsEditing(), QueryLastPlayPos(), QueryProgStart(), RecordingInfo::RecordingInfo(), SaveAutoExpire(), SaveBookmark(), SaveCommFlagged(), SaveDeletePendingFlag(), SaveEditing(), SavePreserve(), SaveTranscodeStatus(), SaveWatched(), ToMap(), and ToStringList(). Referenced by clear(), clone(), FromStringList(), LoadProgramFromRecorded(), RecordingInfo::RecordingInfo(), and SaveVideoProperties(). Definition at line 780 of file programinfo.h. Definition at line 782 of file programinfo.h. Referenced by clear(), clone(), ProgramRecPriority::deactivate(), ProgramRecPriority::FillList(), RecordingInfo::FinishedRecording(), FromStringList(), LoadFromRecorded(), LoadProgramFromRecorded(), ProgramInfo(), RecordingInfo::RecordingInfo(), ProgramRecPriority::scheduleChanged(), RecordingInfo::SubstituteMatches(), ToMap(), ToStringList(), and ProgramRecPriority::UpdateList(). Referenced by RecordingInfo::AddHistory(), RecordingInfo::ApplyRecordRecID(), clear(), clone(), FromStringList(), RecordingInfo::InsertProgram(), LoadProgramFromRecorded(), ProgramInfo(), RecordingInfo::RecordingInfo(), RecordingInfo::SubstituteMatches(), ToStringList(), ProgramRecPriority::updateInfo(), and ProgramRecPriority::UpdateList(). Referenced by clear(), clone(), RecordingInfo::ForgetHistory(), FromStringList(), LoadProgramFromRecorded(), ProgramInfo(), RecordingInfo::RecordingInfo(), and ToStringList(). Definition at line 785 of file programinfo.h. Referenced by clear(), clone(), RecordingInfo::ForgetHistory(), FromStringList(), IsDuplicateProgram(), IsSameProgram(), LoadProgramFromRecorded(), ProgramInfo(), RecordingInfo::RecordingInfo(), and ToStringList(). Referenced by clear(), clone(), FromStringList(), LoadProgramFromRecorded(), RecordingInfo::LoadRecordingFile(), ProgramInfo(), QueryBasename(), SaveBasename(), RecordingInfo::SaveFilesize(), SendAddedEvent(), SendDeletedEvent(), SendUpdateEvent(), RecordingInfo::SetFilesize(), SubstituteMatches(), ToMap(), and ToStringList(). Referenced by clear(), clone(), FromStringList(), RecordingInfo::InsertProgram(), LoadProgramFromRecorded(), ProgramInfo(), ToMap(), and ToStringList(). Definition at line 789 of file programinfo.h. Referenced by clear(), clone(), FromStringList(), LoadProgramFromRecorded(), and ToStringList(). Referenced by clear(), clone(), ProgLister::FillItemList(), ProgramRecPriority::FillList(), FromStringList(), LoadProgramFromRecorded(), TitleSort::operator()(), ProgramCountSort::operator()(), ProgramRecCountSort::operator()(), ProgramLastRecordSort::operator()(), ProgramAvgDelaySort::operator()(), plTitleSort::operator()(), plPrevTitleSort::operator()(), and ProgramRecPriority::scheduleChanged(). Definition at line 801 of file programinfo.h. Referenced by clear(), clone(), FromStringList(), LoadProgramFromRecorded(), MarkAsInUse(), QueryInUseMap(), and UpdateInUseMark(). Definition at line 805 of file programinfo.h. Referenced by InitStatics(), pginfo_init_statics(), and RecordingInfo::RecordingInfo(). Definition at line 808 of file programinfo.h. Referenced by InitStatics(), pginfo_init_statics(), RecordingInfo::SaveFilesize(), SendAddedEvent(), SendDeletedEvent(), SendUpdateEvent(), and RecordingInfo::SetFilesize(). Definition at line 809 of file programinfo.h.